" A few nights to get comfortable, but best mask I have owned. " " For you mouth breathers this is the mask for you. I have 5 other masks and 1 nassel and this is the most comfortable and no leaks. " 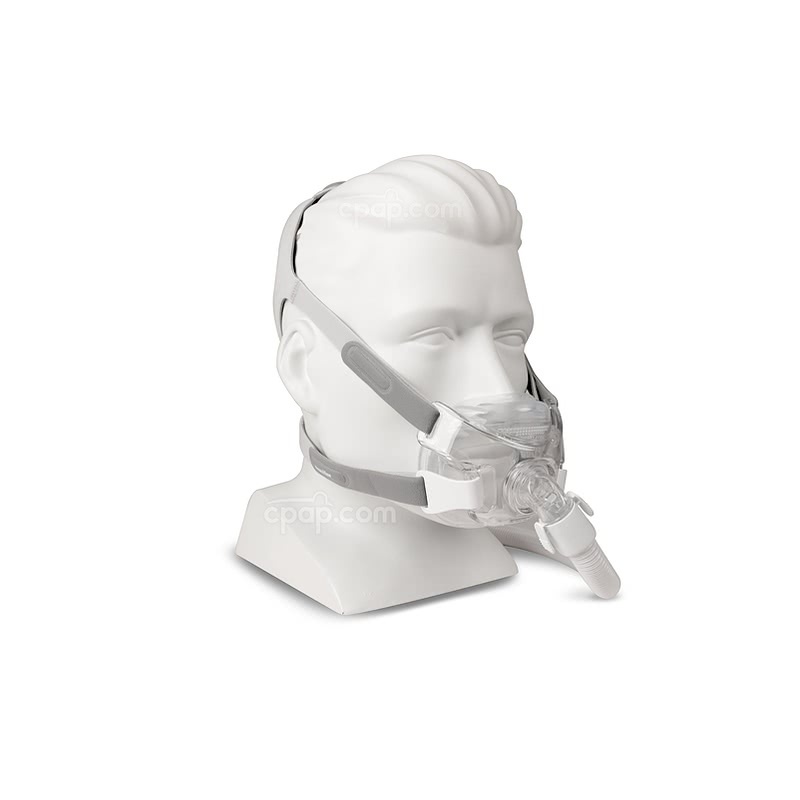 Respironics' Amara View Full Face CPAP Mask with Headgear - Fit Pack is a less invasive full face mask constructed to seal under the nose and around the mouth. The traditional forehead support has been eliminated from the design to provide comfort. Enjoy a wide open view, read a book, or watch television while wearing the Amara View. All cushion sizes are included with the Fit Pack to help the user obtain the optimal fit. 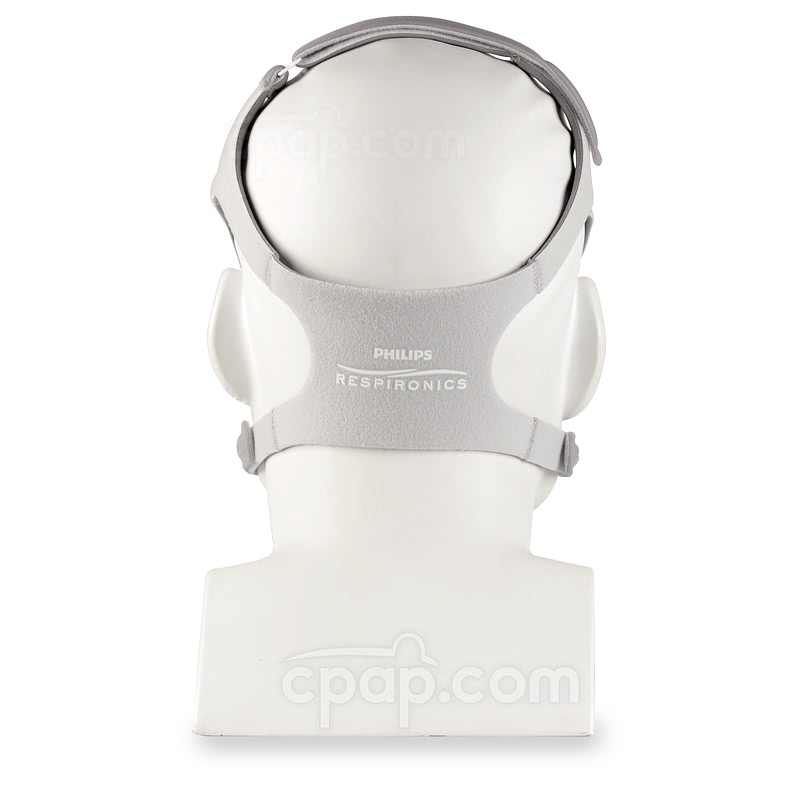 The Amara View Full Face CPAP Mask with Headgear - Fit Pack from Philips Respironics is an original design which uses a rectangular opening in the nasal cushion to deliver therapy air through the nose. The mask sits below the nostrils to yield an open view, and the headgear works in tandem with the mask to create a seal below the nostrils and mouth, eliminating the need for the traditional forehead support. 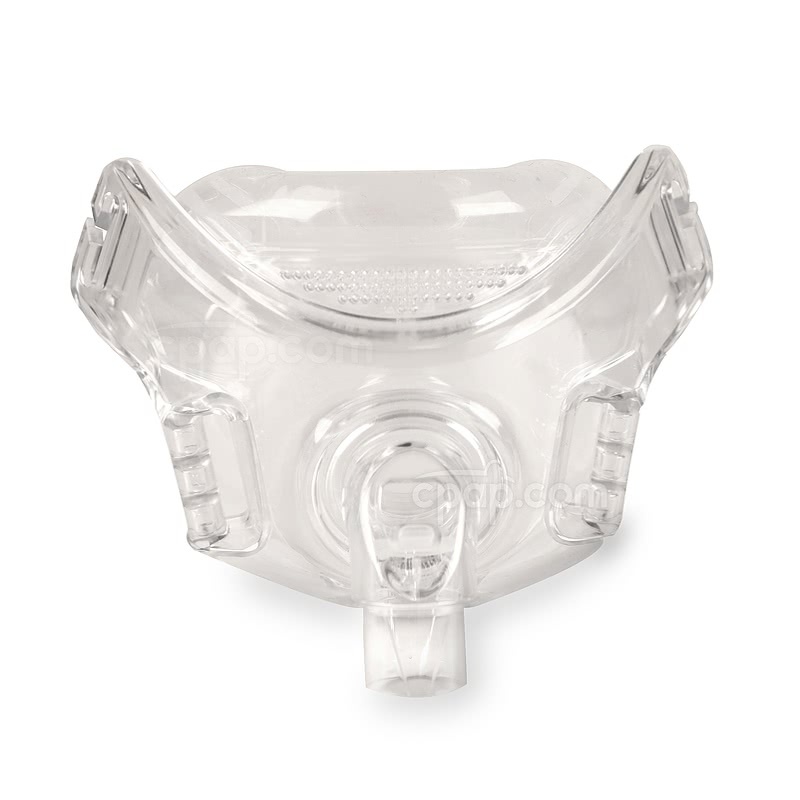 The Amara View Full Face CPAP Mask is supported by headgear which extends from the front of the mask frame to the crown of the head. Headgear adjustments can be made to ensure the mask has a strong seal under the nostrils and around the mouth. With the mask properly positioned, the forehead support is no longer needed. The minimal contact design offers a wide range of visibility, making it easier to watch television and to read before bed. Those who suffer from claustrophobia may find comfort in the Amara View. 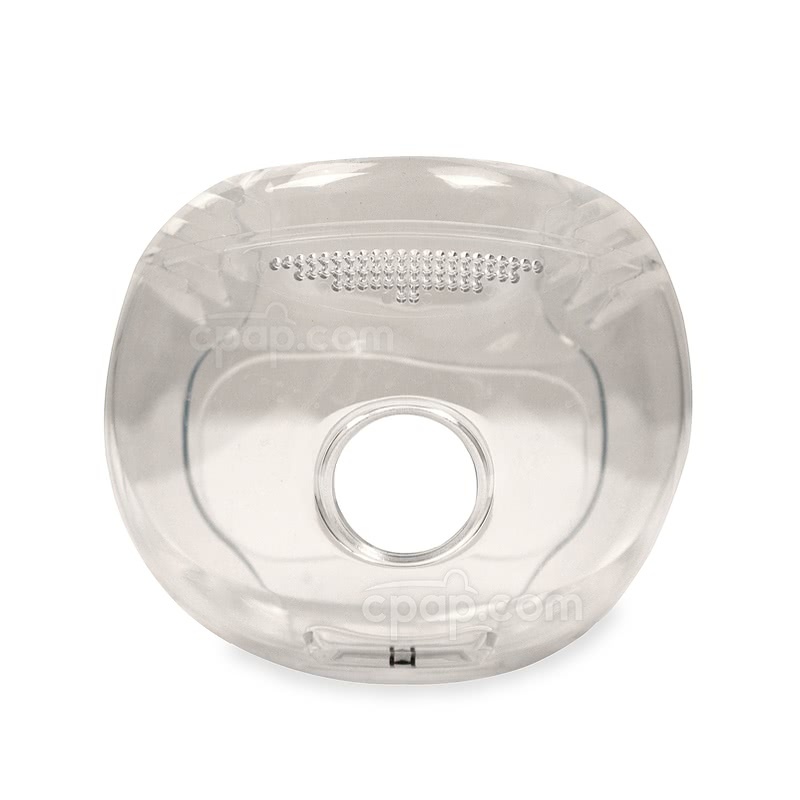 A rectangular opening found at the top of the full face cushion, is intended to deliver the necessary pressure without irritating the nostrils. Gently glide the nostril opening under the nose to find the intended fit. 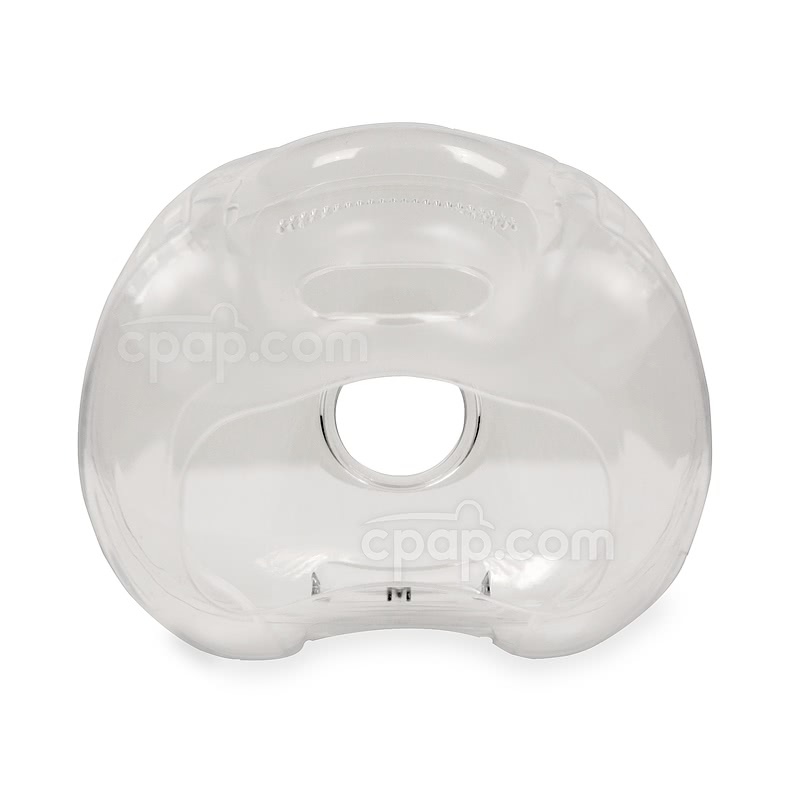 Please Note: The user must keep their nose above the hole to prevent CPAP therapy from being impaired. 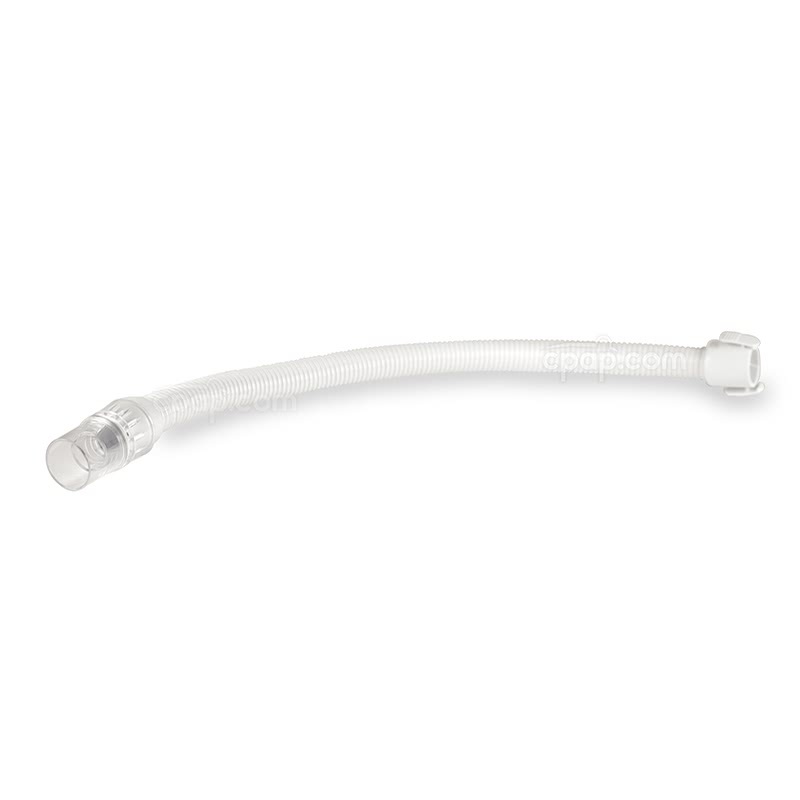 Respironics' short tube for Amara View Full Face Mask extends from the mask frame and connects to the cuff of the CPAP hose. 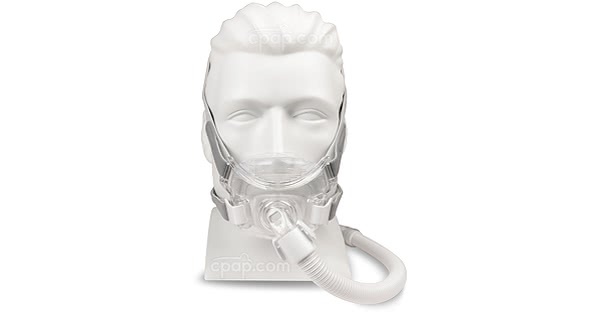 The built-in elbow attaches to the mask frame, while the swivel connects to the user's CPAP hose cuff. 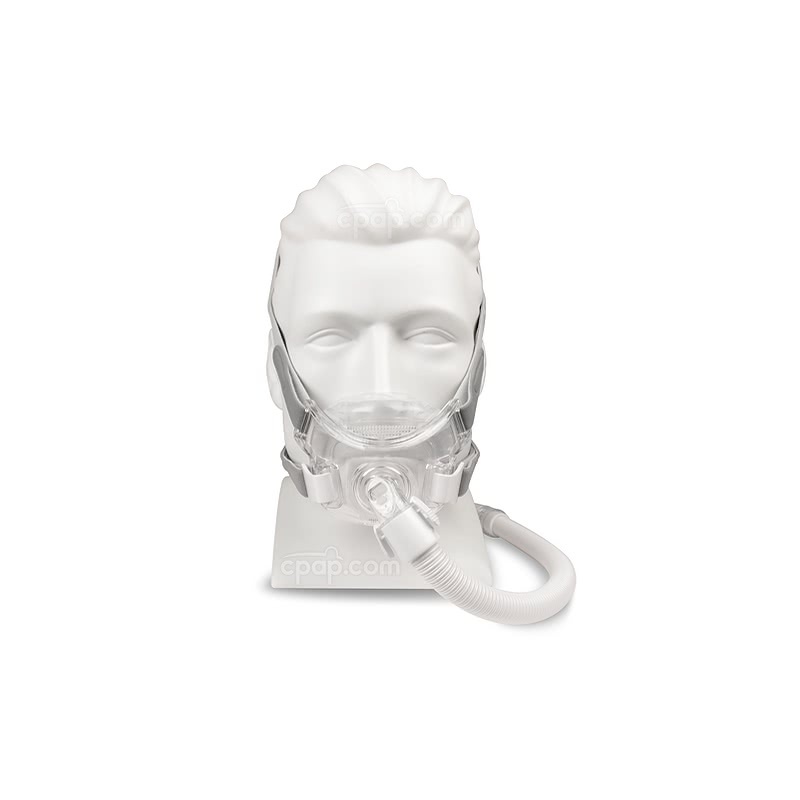 The swivel's 360 degree motion lessens the pull on the CPAP hose and increases flexibility and mobility, which may result in a stronger seal throughout the night. The Amara View mask frame offers a universal fit for all cushion sizes including: Small, Medium, and Large. Since the Fit Pack offers all three cushion sizes, it is easy to attach each cushion to the frame in order to find the perfect fit. This feature is convenient, allowing cushions to be tested and replaced without the purchase of a new mask system. When a replacement cushion is needed, select the exact cushion and replace. The Amara View mask features an unique headgear design with five adjustment points. Four adjustment points are found around the mask frame. The crown strap which crosses directly over the top of the head to form a halo shape has the additional adjustment point. This design is intended to promote a more secure grip and a more even distribution of pressure. 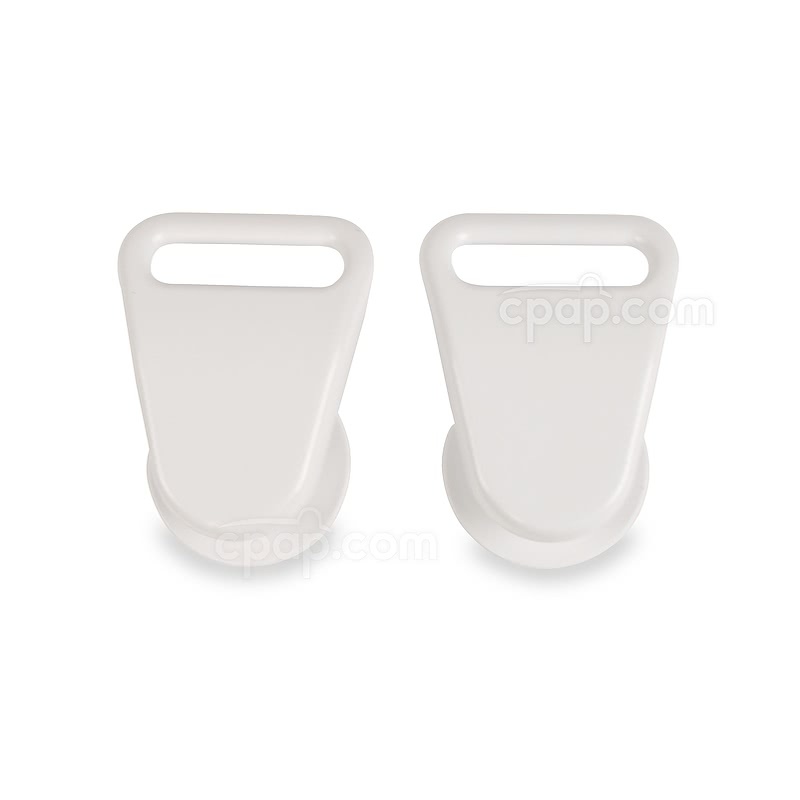 Waking in the middle of the night can be frustrating, but quick release headgear clips are constructed to maintain the shape of the headgear throughout sleep therapy, even when the mask is removed. 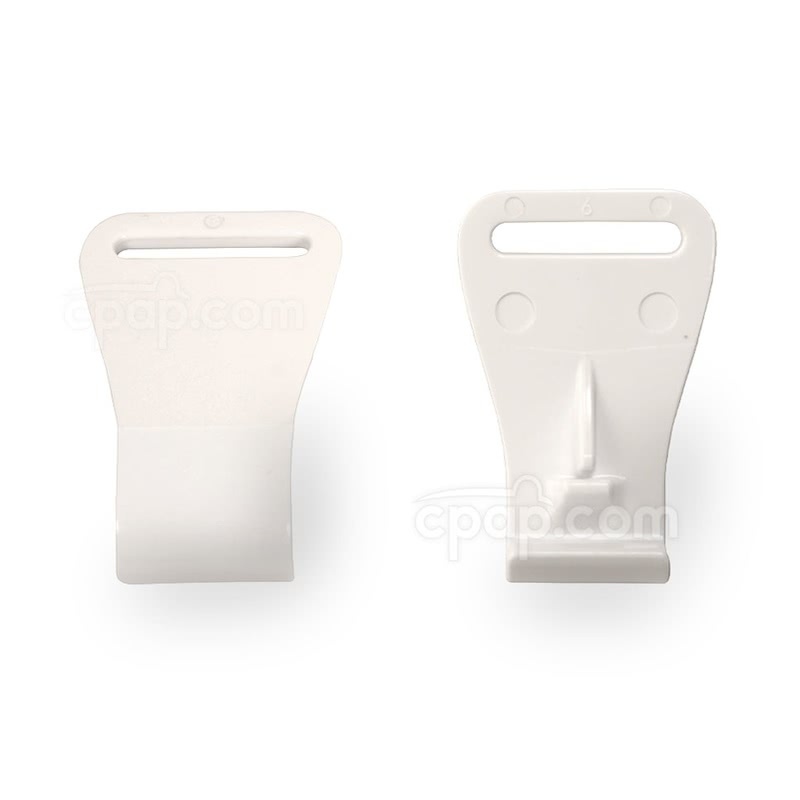 With one swift motion, the clips are used to rapidly attach and detach the Amara View CPAP mask. Before putting on the mask, loosen the headgear straps and remove the headgear clips from the mask frame. Lift the mask and headgear over the head. Then, secure the mask under the nose by skimming your nose over the nostril opening. Hold the mask in position against your face to ensure a good fit. While holding the mask, re-attach the headgear clips to the front of the mask frame. Continue to hold the mask near your face, while pulling each individual headgear tab to tighten the straps. Release your hands from the mask and make subtle adjustments where they are needed. Please Note: The user's nose must glide over the opening. Do not let the nose fall into the opening. Please Note: Regardless of the cushion size, the Amara View Full Face Mask comes packaged with the standard size headgear. Though the replacement headgear is offered in both the standard size and size Large, if change is desired. If using a PR System One Machine, a system one resistance control number from Respironics can be set to allow the machine to compensate for different mask types. 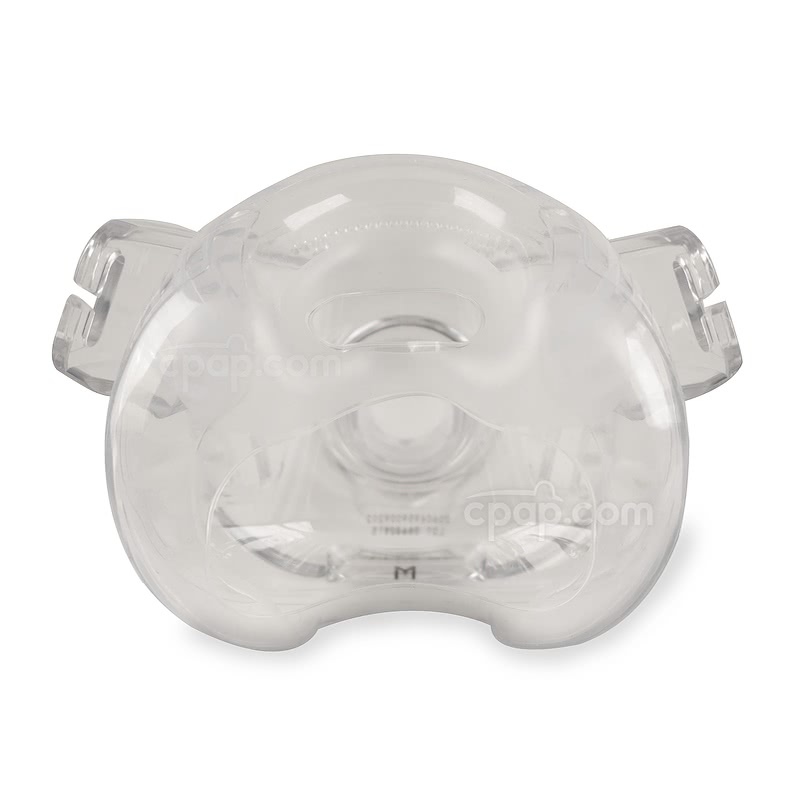 The resistance control number for the Amara View Full Face CPAP Mask is X1. Please Note: System One Resistance Control is for System One Machines only. It is recommended to wash the mask each day and to wash the headgear once a week. Use mild shampoo and warm water to clean both pieces thoroughly. Then, place the mask and headgear away from sunlight to air dry.